I like to get dressed. And, even more so, I like to get my kids dressed. So, as it were, when I saw a job posted on a moms group I follow on Facebook to be a stylist for Mac & Mia, I thought – that is for ME! 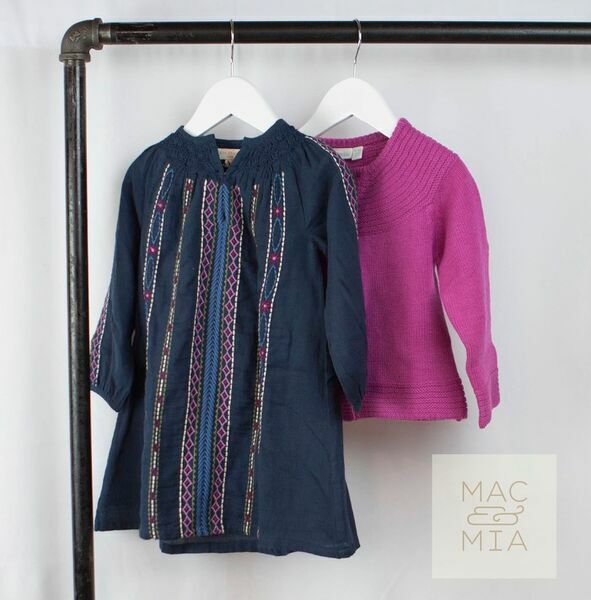 Mac & Mia is a clothing delivery service for children ages 0 to 6 (much like Stitch Fix, if you’re familiar). You give me details about your kids (she hates red and will only wear dresses and skirts, for example) and I fill a box of 8 to 10 clothing pieces and send them to you. You look them over, try them on your child, keep and pay for what you like, and send back the rest. Easy! Convenient! And oh so fun for me! It’s a part-time, work from home job which makes it even that much more appealing and the only way it would work with our little family right now. 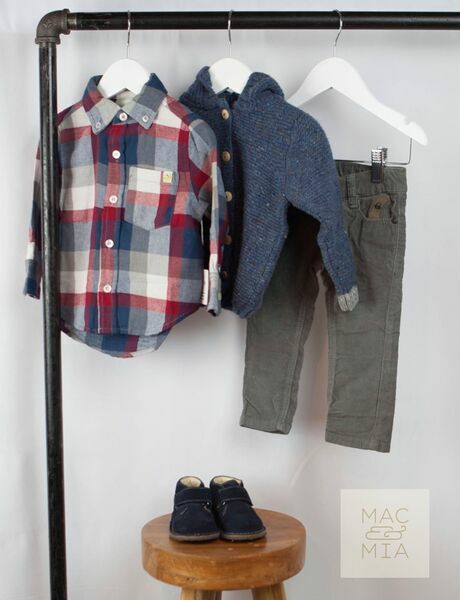 Mac & Mia has tons of clothing brands I work with to find just the right pieces for your little ones. Some favorite brands like JoJo Maman Bebe and Hatley. 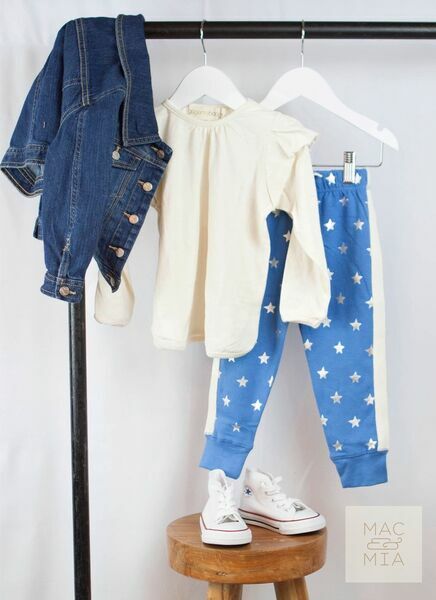 Some new to me brands like Angel Dear (for babies, SO cute). And of course they’re all fun brands like Pink Chicken. So…that’s what’s new, it was time I shared! If you’re interested in signing up and learning more you can use my direct link for Mac & Mia here. Or my stylist code is JessJ. 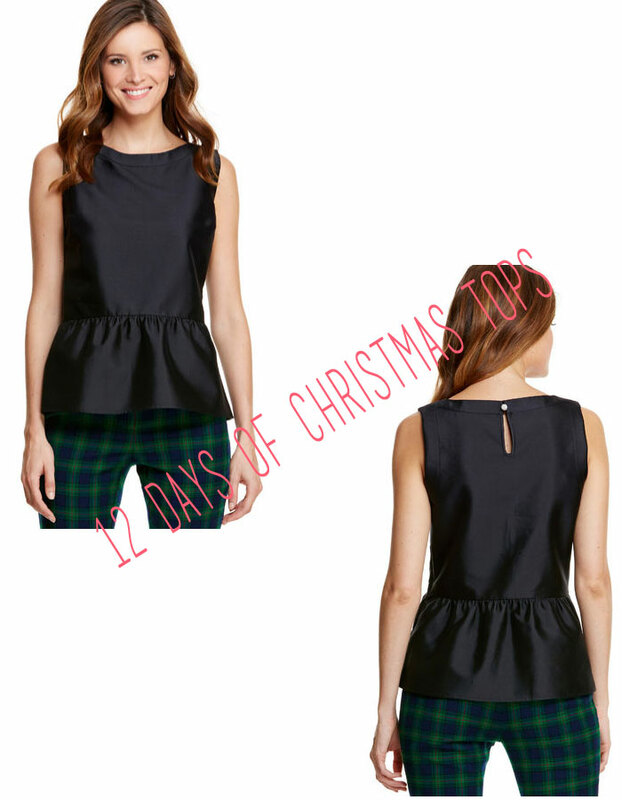 12 Days of Christmas Tops, day 12: On the 12th day of Christmas tops (ok, it’s the 14th but oh well) I present to you a simple but perfect top – the Sleeveless swing peplum top from Vineyard Vines. It’s so cute, so versatile, so seasonless. I hope You’ve enjoyed my little series of 12 Days of Christmas Tops, I had fun putting it together! Check out all of the 12 Days of Christmas Tops. 12 Days of Christmas Tops, day 11: Nothing says the holidays like gold leaf and this is gold leaf in a top! The Goldleaf top from Anthropologie is so perfect for a Christmas top, right? Ps. 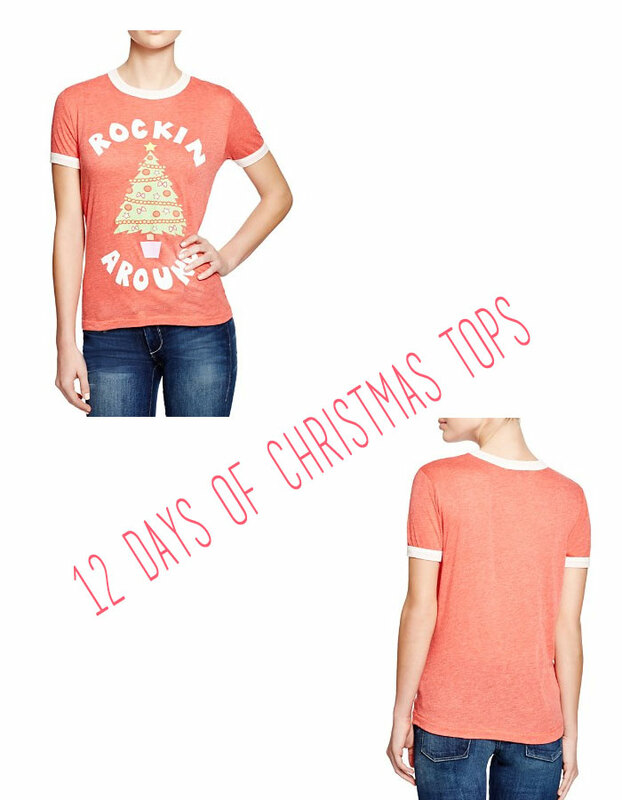 Check out all of the 12 Days of Christmas Tops. 12 Days of Christmas Tops, day 10: Not every party calls for sequins and glitter so today’s top is perfect for a casual get together or afternoon decorating the tree with your family. I love this Wildfox Rockin Around tee from Bloomingdales. Adorable, comfy, and super festive. 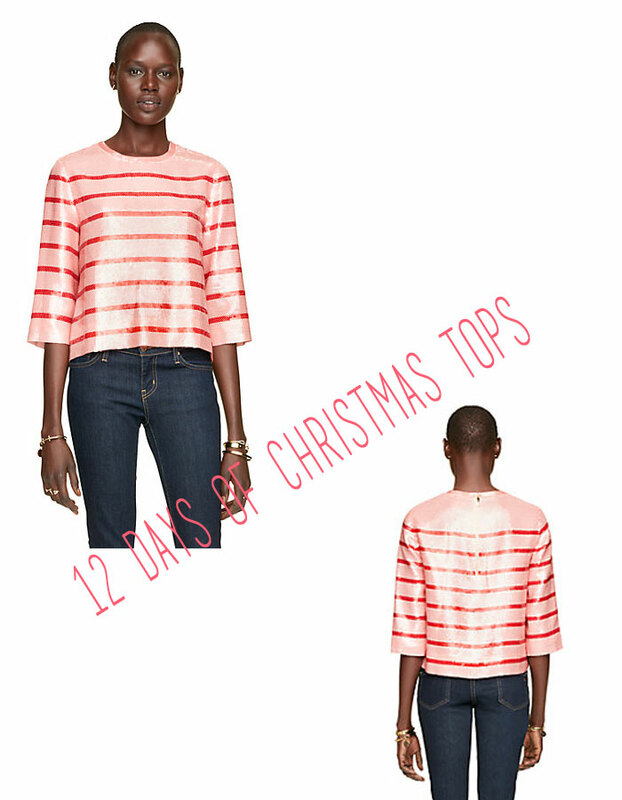 12 Days of Christmas Tops, day 9: This stripe sequin top from kate spade is perfect! It mimics a candy cane in the most adorable way. Full disclosure, I don’t usually like to post things i wouldn’t actually buy myself (and at nearly $500 I will not be adding this to my wardrobe) but sometimes it’s fun to just get inspiration from a piece of clothing and hunt around for a less expensive version somewhere else. 12 Days of Christmas Tops, day 8: This sequined top from H&M could not be cuter (it’s selling out quickly but comes in a sweatshirt, too!). Perfect for any holiday soiree!